This is a great time to be a navalist. In the week since the election of Donald Trump, a growing chorus of voices are talking about how our Navy is set to grow. 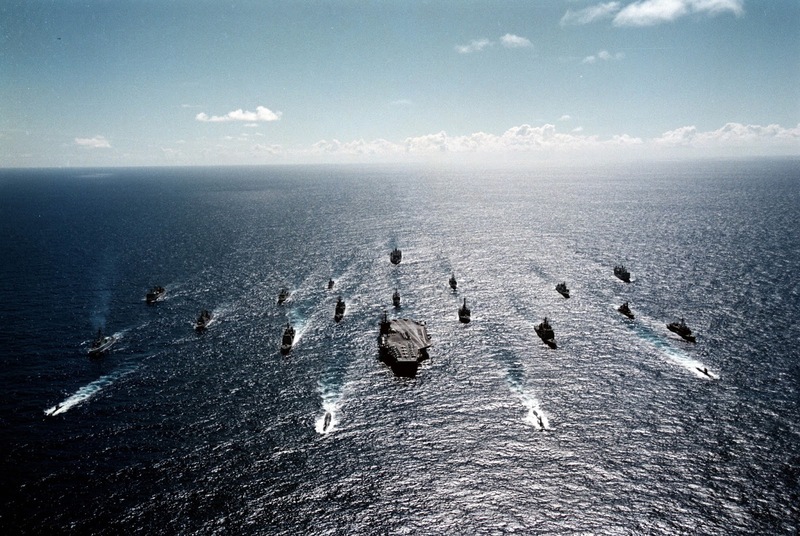 Last Sunday on Midrats with Bryan McGrath we touched on the core argument that feeds and supports the reasons why a large and capable navy is an essential and natural part of the United States. From the birth of our nation to now, the argument and requirement has not changed all that much, just the application and access to resources. I think there needs to be more work done to flesh out the national strategy to justify and explain a larger navy - and then sell that vision, but the President-elect even before the election stated that a core part of his plan to enhance our national security is a larger navy. He actually put a number to it; 350. We are at 272 today, and growing a feet to 350 will take a long time to do, but to get up on the curve, you have to act now. The first step to get there is to start the conversation on ideas on what to do now with what you have ready to go. Our friend Jerry Hendrix from CNAS put out yesterday in The National Interest a great conversation starter, a plan to get things moving in the right direction. This will be an iterative process with a few twists and turns, course adjustments and an occasional correction - but you have to start. There is the background, now to the core. Jerry also brings in an equally important point; there is a lot more to our Navy than ship numbers. We now have a President and a Congress committed to a “peace through strength navy” that will once again allow the United States to maintain global security and stability on the seas. 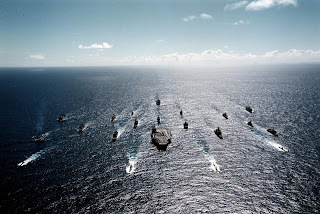 ... A 272 ship Navy simply does not have enough cruisers and destroyers to surround and protect each of the carriers it deploys, but a 350 ship Navy can generate enough platforms to protect a twelve carrier strike force. ...Changing the composition of the carrier’s embarked air wing is the key improvement the Navy can make in the near term to guarantee the success of its carrier strike groups in the future. During the 1950s the average unrefueled range of the carrier’s air wing was 1,200 miles with some aircraft able to go 1,800 miles to deliver their weapons. By the late 1970s the unrefueled range number had shrank somewhat to 900 miles, but the carrier had developed a strong organic tanking capability that could extend the range of its aircraft in flight to meet strategic requirements. Today, the air wing’s average unrefueled range is around 500 miles and its organic mission tanking capability is significantly degraded when compared to the past. How? Here is where the realist nods his head. What do we have at hand? Second, extend the range of the F/A-18 Super Hornets that we already have by completing testing of the conformal fuel tanks that are currently under development and accelerate their introduction to the fleet. This is not just rewinding the clock, but getting back up on step focused on the evolved threat. The Navy needn’t look exactly like it did the last time it had 350 ships, we have far more destroyers today than we did in the 1990s for instance, and they are far more lethal than their predecessors, so perhaps we can have fewer cruisers than we had in the past. Frigates, smaller, cheaper and of a more lethal design than the current Littoral Combat Ship, something more analogous to those built by our European allies perhaps, should be bought in large numbers to provide increased naval presence patrols. Here is the entering argument, a plan to work towards. Twelve carriers, 350 ships, and a longer ranged carrier air wing should be the basis for the United States’ grand strategy going forward. We are a maritime nation. We have always been a maritime nation since our founding, and now there is a commitment to make the investments needed to execute a new maritime based national security strategy. This will be a national effort from the start, an effort that will rebuild Blue Collar jobs throughout the nation in support of our national defense, and while there will surely be challenges to come; there is at least a vision and a number (350) and a beginning on January 20, 2017.